3D printing marketplace uses Artec’s professional-grade scanners to digitally capture history in high resolution and vibrant color. 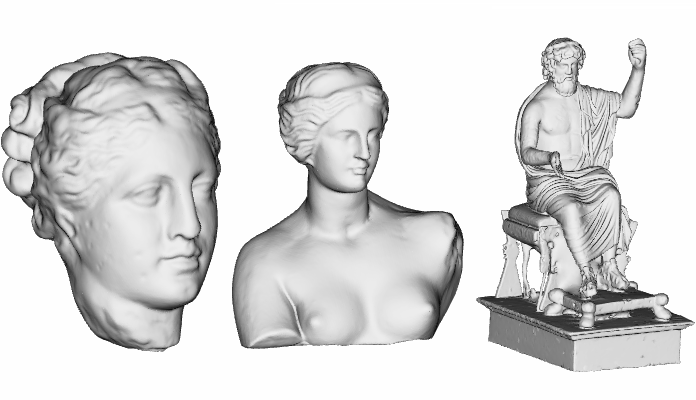 Sofia, Bulgaria and Palo Alto, Calif. January 14, 2016 – Threeding.com, a fast-growing startup for 3D printable models, today announces its latest historical preservation project for the 3D digitization of unique Ancient Greek artifacts. The collection is being made available in a 3D printing-friendly format on its online platform. The project was conducted in collaboration with Artec 3D, a leading developer and manufacturer of professional 3D hardware and software, and Mr. Krasi Todorov, famous artist and inventor of ZN ART, who supported Threeding’s team throughout the restoration process. Threeding’s community will now be able to download and 3D print sculptures, figurines, busts and more. The collection includes hundreds of artifacts from different periods of Ancient Greek history. Threeding’s community will now be able to download and 3D print sculptures, figurines, busts and more. This will give anyone the chance to touch and feel pieces of history and even create a small home museum. Most of the original artifacts are part of a private collection, the owner of which asked to remain undisclosed. Threeding’s team used Artec’s high-resolution Spider and Eva scanners, in addition to its Artec Studio software, to 3D scan the relics and create digital 3D models for printing. The rest of the models were recreated by Threeding’s team with the help of Krasi Todorov. Upon request, the collection will be made available as a 3D object made of sheet material through ZN ART, an original technology based on invention and computer hardware. The first models are currently available at Threeding.com and include the Head of Hygeia, Venus of Milos, Zeus and more. The first models are currently available at Threeding.com and include the Head of Hygeia, Venus of Milos, Zeus and more. "Using our lightweight handheld 3D scanners and advanced software platform, Threeding has been able to add even more value to its impressive historical collection." After the successful completion of this project, there will be more than 1 000 museum objects available for sale in 3D printing-friendly format. This endeavor follows the successful cooperation between Threeding and several European museums, which allowed Threeding to become the largest repository for 3D printable historical artifacts. After the successful completion of this project, there will be more than 1 000 museum objects available for sale in 3D printing-friendly format. Artec 3D is a leading manufacturer of professional 3D scanning hardware and software, developed by a strong team of experts in the collection and processing of 3D surfaces and in biometric facial recognition. Fast and efficient, Artec scanners are used in a great deal of industries, including engineering, security, medicine, entertainment, design, fashion, heritage conservation, and many more. The company has subsidiaries in the United States (Palo Alto), Russia (Moscow) and Luxembourg. For more information about Artec 3D, please visit www.artec3d.com. Krasi Todorov is the author and designer of ZN ART – Museum from Paper, Regional history museum – Vratza, the world’s first of its kind museum that reveals the next level of human development and acquirement of civilization knowledge – the one when the content and awareness will be leading in the educational process and when it will be possible to exchange information or communicate culture in a more liberating creative way. For more information about Krasi Todorov, please visit www.artbox88.com/krasi. Professional-grade Spider scanner and Studio 10 software selected to expand university’s reality capture capabilities. Artec Spider and Artec Studio 10 make a perfect solution for 3D visualizing a collection of skulls at St. Cloud State University in Minnesota.